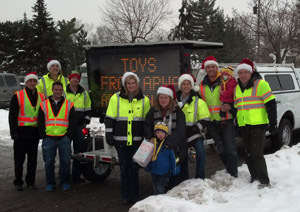 The APWA Minnesota Chapter orchestrated our first annual collection of toys and cash for the benefit of the Toys for Tots program. 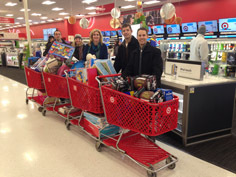 With only a few weeks of advertising prior to the Fall Conference, chapter members rose to the occasion and contributed an entire pickup truck load of toys so that Minnesota kids didn’t have to go without this Christmas. Imagine the looks on the faces of the children -- perhaps expecting little to nothing due to their personal situations -- as they opened a package to find their very own, brand new toy for Christmas! Whether we realized the impact that our generous contributions would make or not, it is important to acknowledge our part in the primary goal of Toys for Tots -- to deliver a message of hope to less fortunate youngsters and assist them in becoming responsible, productive, patriotic citizens. An important side benefit for the chapter, as well as the communities that we represent, was the uniting of all our members from diverse local communities in a common cause -- helping our nation’s most valuable resources, our children. The chapter was identified for its significant contribution on KARE 11 TV, during the 4 p.m., December 20 newscast, as part of their annual Toys for Tots collection at the station. Chapter representatives introduced the chapter and shared information about this initial chapter donation. We plan are to make this an annual event and hope that we eventually need a parade of snow plows to deliver all of the toys. Please put next year’s collection on your calendar for the Fall Conference. The mission of the U. S. Marine Corps Reserve Toys for Tots Program is to collect new, unwrapped toys during October, November, and December each year, and distribute those toys as Christmas gifts to less fortunate children in the community in which the campaign is conducted. Over its life span (67 years), the Marine Toys for Tots Program has distributed over 469 million toys to over 216 million less fortunate children. 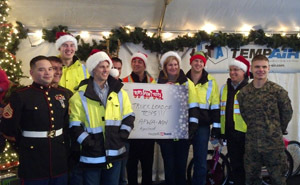 In 1996, Toys for Tots was expanded to cover all 50 states.